SEOUL, South Korea (CNN) -- Thousands of protesters battled riot police in downtown Seoul early Sunday morning after a rally opposing South Korea's decision to import U.S. beef turned violent. More than 100 were wounded, the state news agency reported. 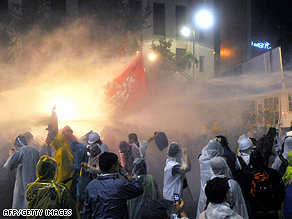 Police use a water cannon to disperse protesters during a rally against U.S. beef imports in Seoul on Sunday. Clashes broke out after more than 15,000 protesters headed toward the presidential office, news agency Yonhap said. The demonstrators used ropes to pull down police buses that had been parked around the presidential office to block the marchers from entering. Many carried steel pipes and hurled rocks at officers. Police fired back with water cannons and fire extinguishers. The widespread public protests essentially paralyzed the government of President Lee Myung-bak, who replaced seven top aides this month and plans to reshuffle his cabinet. After a series of negotiations, Seoul and Washington came up with a revised agreement on June 21 -- one that limits imports to cattle less than 30 months old. Animals more than 30 months old are considered at a greater risk for mad cow disease, which can be transmitted to humans. U.S. Secretary of State Condoleezza Rice, during a visit to visit to Seoul as part of an Asian tour, emphasized Saturday that American beef is safe and that her government will continue efforts to win consumer confidence. The assurance did little to placate demonstrators who took to the streets late Saturday night, leading to the latest riots. Eating meat products contaminated with the illness has been linked to variant Creutzfeldt-Jakob disease, a rare and fatal malady in humans. Until the 2003 ban, South Korea was the third-largest market for U.S. beef exporters. The U.S. beef industry has lost up to $4 billion since the market closed, according to the U.S. Meat Export Federation. The imports are expected to resume this month.